So in fairness the integrator was not trying to profit on the deaths of six-year olds in Connecticut, just all the other children and teens shot in the past decade. 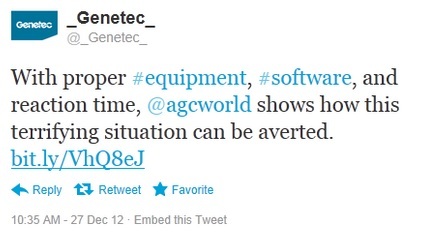 As for Genetec, what excuse do they have? Detection of the shooter comes from a teacher who happens to be looking at the window as the shooter (with comic book mask and rifle in hand) walks towards the school. The likelihood of such a detection is very slim as most teachers focus on the classroom. The armed gunmen strangely chooses not to shoot in the locked door, which is an optimistic assumption and one that did not hold true in Newtown. If they have a gun and are planning to shoot dozens of people, why not shoot the door? The gunman takes his time while the police arrive in record fashion. While average law enforcement response time is 18 minutes in such cases, this video implies that it is within three. While a few nice system features are demonstrated - automatic lockdown of doors, mobile monitoring and integration with the police - these are highly unlike to 'avert' a school shooting. Even from the perspective of the integrator and Genetec, prudence would dictate not setting such unrealistic expectations especially given the potential liability and blame they would shoulder in an actual incident.